BYU's first Worldwide Alumni Gathering brought the university family together from all over for one event— in 200 places around the world. 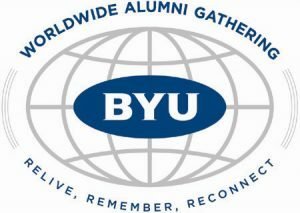 On Nov. 7, 2003, BYU alumni met around the world and in the Tabernacle on Temple Square for the Worldwide Alumni Gathering. The satellite broadcast allowed a potential audience of 330,000 alumni to meet Cecil O. Samuelson, the university’s new president, and hear Church President Gordon B. Hinckley express his confidence in BYU and its graduates. More than 150 alumni went to the Pensaquitos Stake Center in San Diego for the event coordinated by Phillip W. Wing, ’81, chapter chair. “It was a real positive experience to meet and visit after the broadcast,” he says. Another purpose of the San Diego meeting was to encourage donations for the victims of the Southern California fires. President Samuelson pointed out that the 145 alumni chapters around the world play a vital role in the continuing growth and vitality of BYU. He emphasized the expansion of BYU’s mentored-learning program and explained how students can take on in-depth research and creative projects under the direction of a seasoned faculty member. Enhancing the evening were musical selections performed by the BYU Men’s Chorus. The Alumni Association’s president, Brent W. Romney, ’82, and president-elect, Carr C. Krueger, ’85, also spoke.